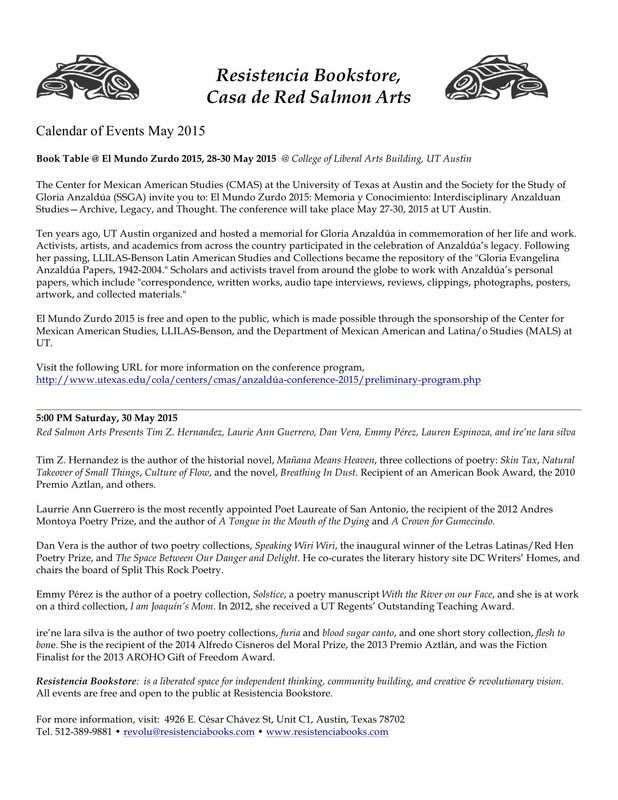 The Center for Mexican American Studies (CMAS) at the University of Texas at Austin and the Society for the Study of Gloria Anzaldúa (SSGA) invite you to: El Mundo Zurdo 2015: Memoria y Conocimiento: Interdisciplinary Anzalduan Studies—Archive, Legacy, and Thought. The conference will take place May 27-30, 2015 at UT Austin. El Mundo Zurdo 2015 is free and open to the public, which is made possible through the sponsorship of the Center for Mexican American Studies, LLILAS-Benson, and the Department of Mexican American and Latina/o Studies (MALS) at UT. Tim Z. Hernandez is the author of the historial novel, Mañana Means Heaven, three collections of poetry: Skin Tax, Natural Takeover of Small Things, Culture of Flow, and the novel, Breathing In Dust. Recipient of an American Book Award, the 2010 Premio Aztlan, and others. Laurrie Ann Guerrero is the most recently appointed Poet Laureate of San Antonio, the recipient of the 2012 Andres Montoya Poetry Prize, and the author of A Tongue in the Mouth of the Dying and A Crown for Gumecindo. Dan Vera is the author of two poetry collections, Speaking Wiri Wiri, the inaugural winner of the Letras Latinas/Red Hen Poetry Prize, and The Space Between Our Danger and Delight. He co-curates the literary history site DC Writers’ Homes, and chairs the board of Split This Rock Poetry. Emmy Pérez is the author of a poetry collection, Solstice, a poetry manuscript With the River on our Face, and she is at work on a third collection, I am Joaquín’s Mom. In 2012, she received a UT Regents’ Outstanding Teaching Award. ire’ne lara silva is the author of two poetry collections, furia and blood sugar canto, and one short story collection, flesh to bone. She is the recipient of the 2014 Alfredo Cisneros del Moral Prize, the 2013 Premio Aztlán, and was the Fiction Finalist for the 2013 AROHO Gift of Freedom Award.